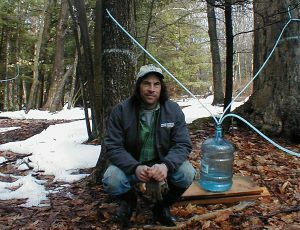 Ken waits for the sap to flow. 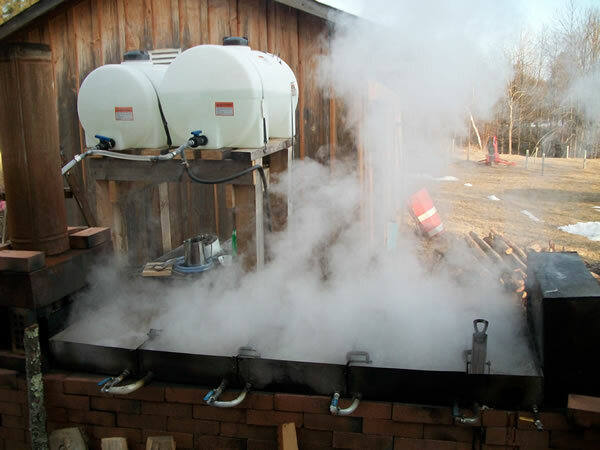 View photos of our entire operation, from the tapping of trees, to collection of sap, to the “boiling off” in our wood-fired evaporator. Enjoy the following video of the sugaring process, then read our illustrated explanation of how we get if from the tree to your breakfast table, step by step. 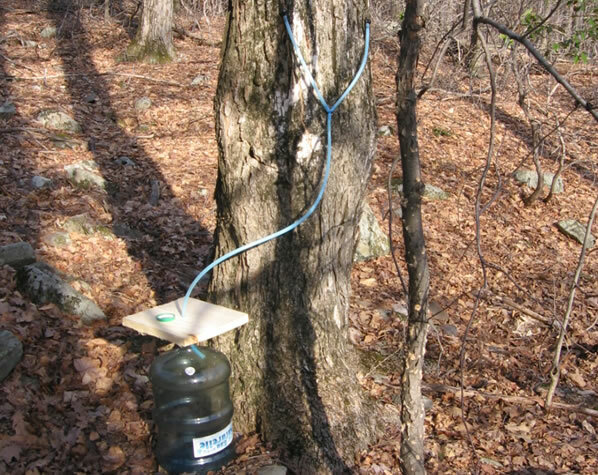 Tapping of Sugar Maple trees on Lackawack Hill. Collection of sap from the entire “Sugarbush”. Lots of firewood is collected, cut, and split to feed the fire. Sap flows into a series of boiling pans. 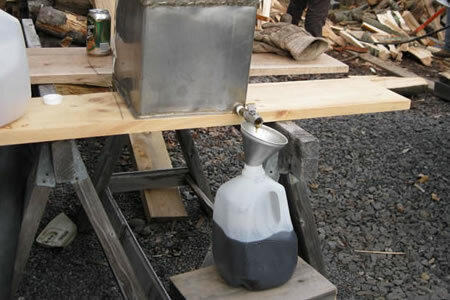 over 40 gallons of sap needed to produce 1 gallon of syrup. Syrup is “drawn” from the final pan and filtered into temporary storage containers. 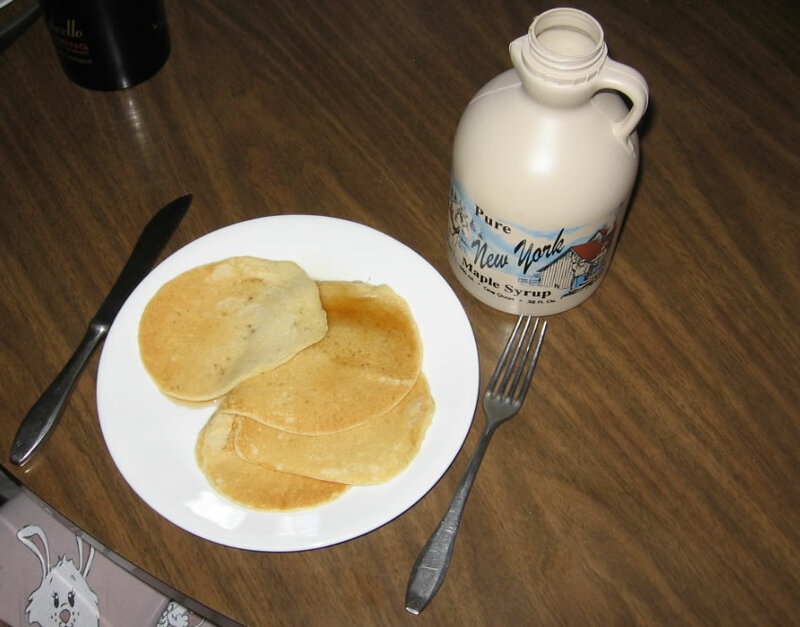 Enjoy Christensen Farm Maple Syrup on pancakes & more! 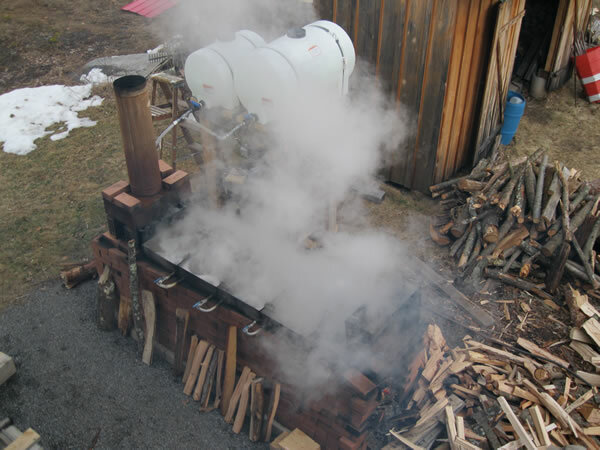 As springtime approaches and the days warm, the sap starts flowing in the maple trees and sugarmakers get busy – tapping the trees, collecting the sap and boiling it down into maple products. For our little operation, the work began in mid February. 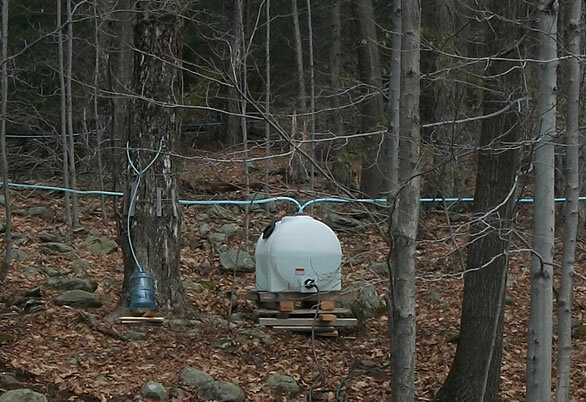 Last year we put in a 200+ tap tubing system in an approximately 5 acre sugarbush on Lackawack Hill. We started this season off by repairing lines which had been stretched or broken by falling trees and branches due to winter storms. Many of the longer lines which sagged were buried in the 20” of frozen snow and had to be chopped out to get them up higher for setting the taps. In the process I fell about a dozen times due to the ice-crusted snow and the uneven terrain and tripping hazards hidden beneath it. The next item on the worklist was washing out all the sap collection, transport and evaporator feed tanks and setting them in place in the woods, the Chevy pickup bed, and above the evaporator. Now we were ready for tapping, and the next day was spent drilling new 5/16” tap holes into the trees (you cannot use the old holes) and setting the taps. The whole tubing system drains by gravity into the collection tank, so care must be taken to maintain the proper pitch to allow the sap to drain properly. In areas which are relatively steep this is easy to do, but where the topography is not so cooperative it can be pretty challenging to do. Some of the taps end up pretty high on the trees – and pulling them at the season’s end and after the snow is gone is not much fun. 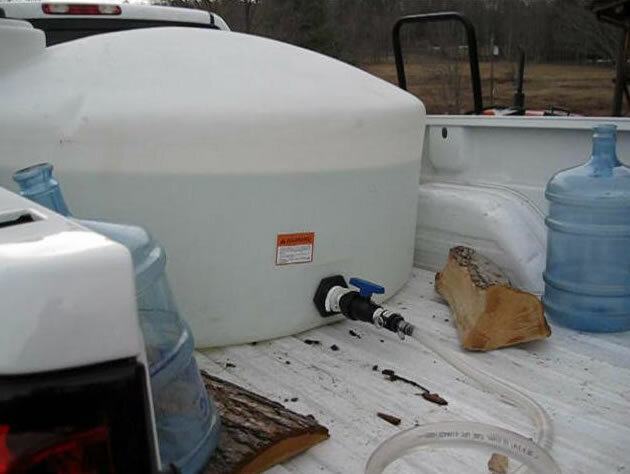 I have the collection tank set up on the uphill side of a back road so that I can fill the transport tank in the pickup at the side of the road by gravity via a hose. From there it’s a ¾ mile trip down to where we’ve got the evaporator and feed tanks set up next to the woodshed, and I use a little Honda water pump to fill the feed tanks from the transport tank. My homemade evaporator consists of a preheater and 5 evaporating pans piped up in series, and the last pan is where the syrup is drawn off. I fashioned the pans from stainless steel sheet metal which I cut, bent, and silver soldered, and soldered in the necessary pipe fittings to get the sap from one pan to the next. 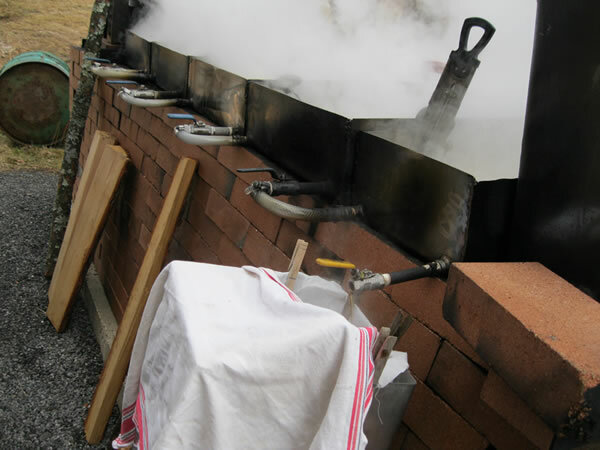 The pans are placed atop a furnace built of stacked fire brick. 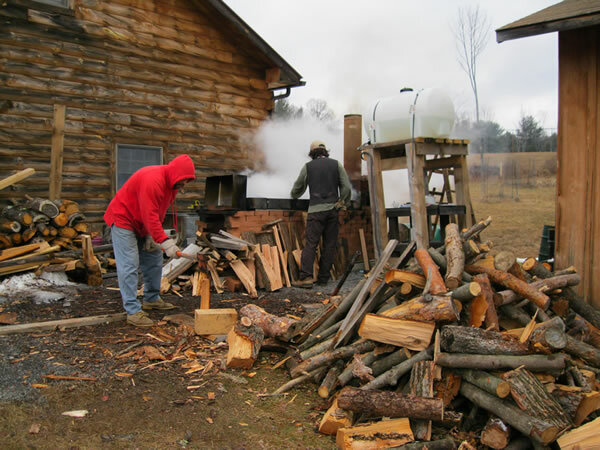 Once we’ve collected enough sap to begin the sugaring process, we get a fire going in the furnace. After the sap starts to boil and the water is vaporized, the sap becomes more concentrated, sweeter and takes on a slight amber color. I regulate the flow into the preheater with a manual ball valve, as opposed to commercial evaporators that have float actuated valves to regulate the flow into the evaporator pans. As the boiling progresses and the sap becomes more concentrated in each successive pan, the amber color becomes more pronounced as well. Careful attention must be paid to the boiling process in the last pan, because as the sap attains a high concentration of sugar it can foam up very rapidly, overflow and make one hell of a sticky mess under a hot fire. Placing a very small amount of butter eliminates this problem as the butterfat lowers the surface tension of the bubbles, causing them to pop before the foam rises up and causes mischief. The final pan’s contents eventually boil down to a 67% sugar concentration (ballpark 7 degrees F above boiling point of water at ambient conditions, at which point I draw it off through a filter bag into the filter tank I fabricated, also from stainless steel. I put the filtered syrup into gallon containers as it is being produced and when the container is full I put it into my cooler (a stone lined spring fed frog pond) until final processing and bottling. For final processing the syrup is heated in a similar pan over a stove to 190 degrees F to pasteurize it for long term storage, and the sugar content is checked and adjusted as necessary. If the sugar content is not quite at 67% it is boiled down a bit more, and if it is too high a bit of spring water is added to bring it to 67% sugar content. 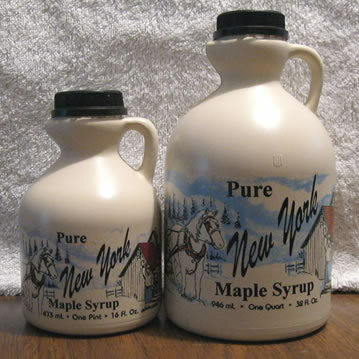 Legally, only 67% sugar content can be called maple syrup! Enjoy Christensen Farm Maple Syrup on pancakes, waffles & just about anything else in place of sugar!